If you’ve followed my coverage of the utility sector over the past three decades, you know that I tend favor a buy-and-hold investment strategy. The rationale is simple: You’ve got to stick around to collect dividends and avoid punitive taxes. Moreover, a growing dividend eventually leads to a higher stock price and corresponding capital gains. When I launched Conrad’s Utility Investor in August 2013, I made sure to stick to those principles with my Conservative Income Portfolio and Top 10 Drips Portfolio. These tried-and-true strategies have helped both model Portfolios to trounce sector and market averages since their inception. But in this aging bull market, value-oriented investors who are willing to buy the dips and sell the surges can book impressive capital gains. My Aggressive Income Portfolio takes calculated risks on names that offer the best near-term upside potential. Our first big score came in March 2014, when we booked an almost 60 percent gain in Italian utility Enel (Milan: ENEL, OTC: ENLAY) after a six-month holding period. Enel subsequently slashed its dividend by more than 18 percent, but we had already moved on to greener pastures. Last week, we booked a more than 50 percent gain on Windstream Holdings (NSDQ: WIN), a name that joined the Aggressive Income Portfolio on Oct. 1, 2013. When we added Windstream, the stock yielded almost 13 percent and faced significant skepticism about the rural telecom’s ability to weather customer attrition in its traditional business lines and the end of federal tax subsidies. Even before Windstream announced plans to spin off some of its copper and fiber network as a real estate investment trust (REIT), the embattled company’s solid quarterly results had squeezed short sellers and left us sitting on a 35 percent gain. Contrarian investing involves a willingness to make reasoned bet against the conventional wisdom and the confidence to buy your best investment ideas during the inevitable pullbacks. 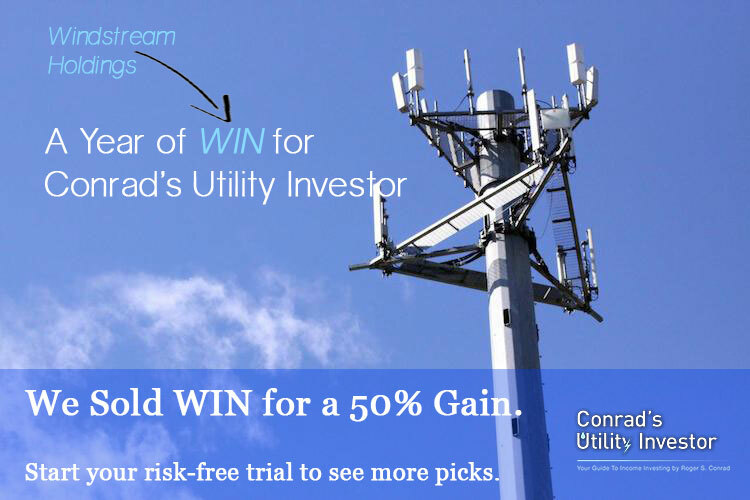 Windstream entailed significant risks when I first added the stock to Conrad’s Utility Investor’s Aggressive Income Portfolio. High-yielding stocks are usually cheap for a reason. And although the rural telecom operator’s solid quarterly results hurt the shorts, the stock still entailed many of the same risks when we issued our sell call. Contrarian investors must have a firm understanding of why a stock looks cheap and the potential downside risk. We always try to impartially assess the company’s ability to deal with its challenges and beat the market’s gloomy outlook. If a clear path to a potential turnaround doesn’t exist, we remain on the sidelines and look for opportunities elsewhere. Successful contrarian investors likewise keep constant tabs on company-specific developments and set clear criteria that the company must meet to justify maintaining their positions. Finally, investors must stay disciplined and be ready to exit a position once it fulfills their profit objective or tests their tolerance for pain. Although we felt that the bearish case against Windstream Holdings was overdone, we did not expect the rural telecom to announce plans to spin off its copper and fiber network into a publicly traded REIT. The company has obtained a private-letter ruling from the Internal Revenue Service approving the REIT spin-off and plans to complete this transaction in the first quarter of 2015. This scheme would give current Windstream’s shareholders an equivalent number of shares in the trust. REITs generally command much higher multiples than Windstream and other rural telecom operators. Whereas Windstream’s stock trades at 6.7 times operating income before depreciation and amortization (OIBDA), the firm’s internal projections calls for the REIT to fetch 14.4 times OIBDA. We regard Digital Realty Trust (NYSE: DLR) and other REITs that own data centers as a better comparable for Windstream’s prospective spin-off because of the industry’s highly competitive nature. Although Digital Realty Trust’s stock has generated a total return of 33 percent this year, the shares still trade at only 9.5 times OIBDA, compared to management’s forecast for a price-to-OIBDA multiple of 14.4. Nevertheless, even this lower valuation implies a higher multiple for Windstream’s network. And this structure involves several other uncertainties. Under the terms of the transaction, Windstream would retain exclusive rights to use the copper and fiber networks contributed to the REIT, meaning that the spin-off would generate all of its cash flow from a single customer. This business model differs fundamentally from a REIT that owns residential apartments with rental agreements with thousands of individuals and households. Management also expects this transaction to allow Windstream to retire $3.2 billion worth of debt and reduce its leverage to 3.3 times–another big positive for the stock. However, the question remains whether the embattled telecom’s shares would still command 6.7 times OIBDA after the spin-off reduces its asset base; the value unlocked by the REIT could be offset by a decline in the parent’s share price. Finally, Windstream’s shareholders will suffer a 30 percent reduction to their annual dividend after the company completes the proposed spin-off. Instead of the current quarterly payout of $0.25 per share, investors will receive $0.15 per share from the REIT and $0.025 per share from Windstream–a total of $0.175 per quarter, or $0.70 annually. If management’s valuation outlook pans out, capital gains would easily offset the loss of $0.30 per share in annual dividend payments. And the $180 million that Windstream will save each year by reducing its overall dividend roughly corresponds to the increase in cash taxes that the company faces over the next few years. Are these savings the primary rationale for the deal? If so, this strategy marks an implicit departure from management’s reassurances that the telecom company’s revenue had stabilized and that the dividend remained secure. Booking a gain on Windstream turns a paper profit into a real one means that we no longer need to worry about these uncertainties, though I will continue to track the company’s fortunes in my Utility Report Card. Conrad’s Utility Investor’s Aggressive Income Portfolio contains several other emerging opportunities for investors willing to assume a bit more risk. For example, we’re already up about 40 percent in a former utility that has transformed itself into a pure-play exploration and production company in the Permian Basin and has the potential to deliver even bigger gains as its development program accelerates. And if a buyer steps up to the plate, the stock could head a lot higher in a hurry. Meanwhile, our top turnaround play for 2014 raised its quarterly distribution for the first time since July 2012 and appears to be well on the path to recovery. This master limited partnership (MLP) has already rallied by 30 percent from its 52-week low but still offers a juicy 6.6 percent yield. The latest addition to our Aggressive Income Portfolio is another special situation, an undervalued utility that’s making the transition from thermal power plants to solar power. I’ve covered this stock for almost three decades and never thought I’d upgrade the name to a buy–let alone add the position to one of my model portfolios.